Tip: Instead of one large picture you can use many smaller ones. Here is a design tip for you. Do you have a large wall the demands a larger than life piece of artwork? One trick the professional designers use is the grouping of smaller objects to form a larger design element. Here we have chosen some nice Florida nature shots and placed them in frames of equal size. You can do that with almost any subject. It works best if the frames have the same color and the pictures speak the same language. In this case we have mostly green and blue nature subjects in close up photographs. Its easy on the budget as well. We used inexpensive frames from the craft store and printed the photos on our inkjet printer. You can do all black and white photos of architectural items or pretty much any subject matter that give visual interest and add a storyline to your design. How about you document your hobbies or travel with a feature wall. 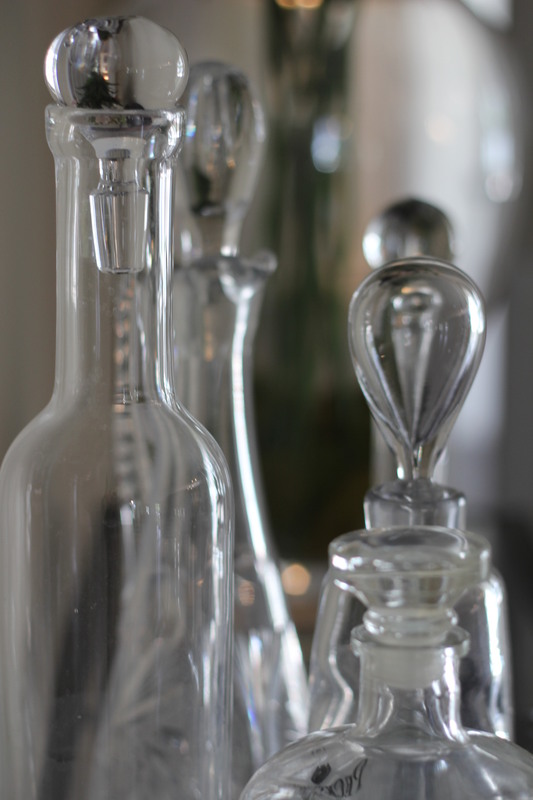 If you do it well, it shows your personal story as much as it enhances your interior design. Comfortable Elegance – house on Carmona Ct sold in 2 days. Call me comfortable! This should be what your design communicates. We are not talking about an overstuffed, oversized recliner couch. We are talking about a general style that shows classy lines and comfortable livable design elements that makes sense in a practical way. Most people do not want to buy into a furniture museum, where they do not find themselves, but rather look for a space that promise the feeling of home. In this staging job we have taken the nice floor plan with formal areas and made even the formal space warm and inviting. We wanted the visitor to the house feel like the formal living space is fully usable in an everyday setting and not just reserved for a once a year occasion. 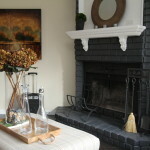 The fireplace mantel was a bit dirty and looked outdated so we gave it a paint treatment with a crisp dark grey paint color and a contrasting white mantel. The colors are mostly neutral. We incorporated some stark contrasts that read well in pictures and on the video. If the color differences are to subtle they might get washed out in a photo. Not everything that shows well in real live translate equally good in pictures. We typically increase the contrast in our temporary staging designs to give more drama and stunning visuals. Needless to say, houses do not have to cost a million bucks to look like it. Case and point the property flip in an Orlando suburb. Selling a decent looking house in the mid 100’s is easy when it is a showstopper. 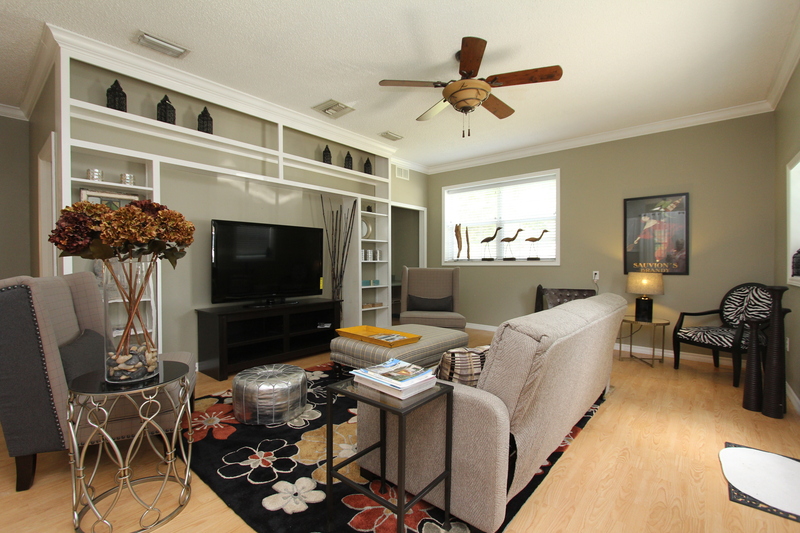 This staging job in Winter Garden shows the potential of a very nice newer home with formal living and dining are in the pictures above. 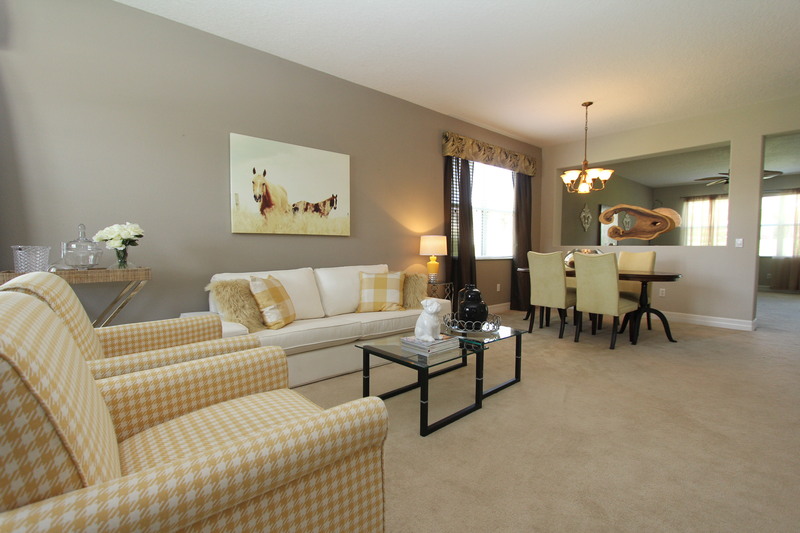 The large space was structured with light and bright furniture in a color scheme dominated by yellow tones. The window treatment was existing so the Designer Helene Bonello-Strauss used them as color reference for the rest of the room. The intent was to bring in light colors to create some contrast to the darker tones in the wall color. Contrast reads better in pictures so the design was kept in similar tones for the room with a lot of whites and neutrals and some darker tones in the wood of the dining set. The yellow parson chairs grab the colors from the window treatments while connecting with the living area furniture. 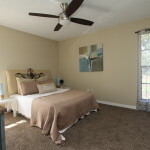 Below is the huge master suite with a blue wall as a backdrop. 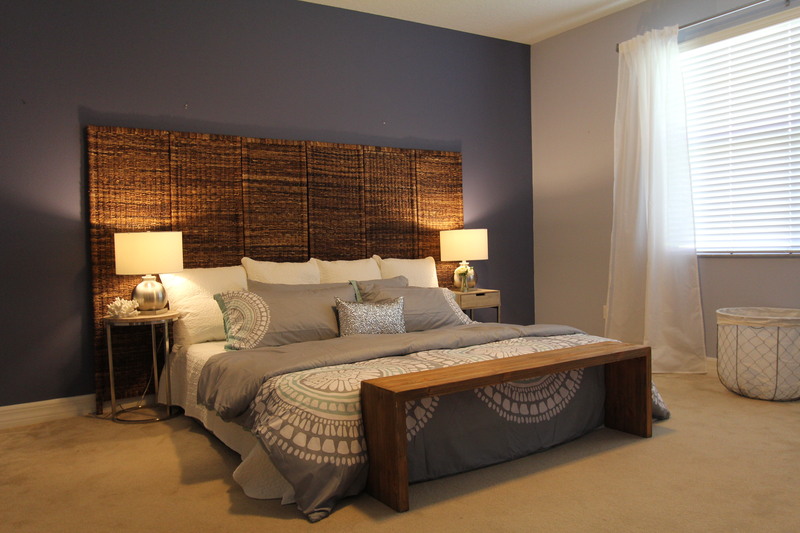 The combination of the darker wicker in the headboard works well with the blue wall. 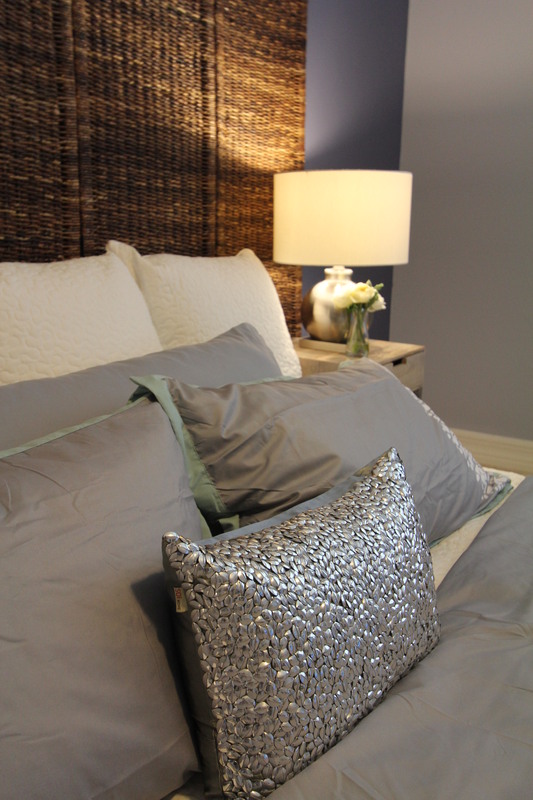 The bedding shows different blues and grey with a sparkle of silver. Anyone interested in this beautiful home contact the listing agent Scott Butts from Remax at 407-629-6330. 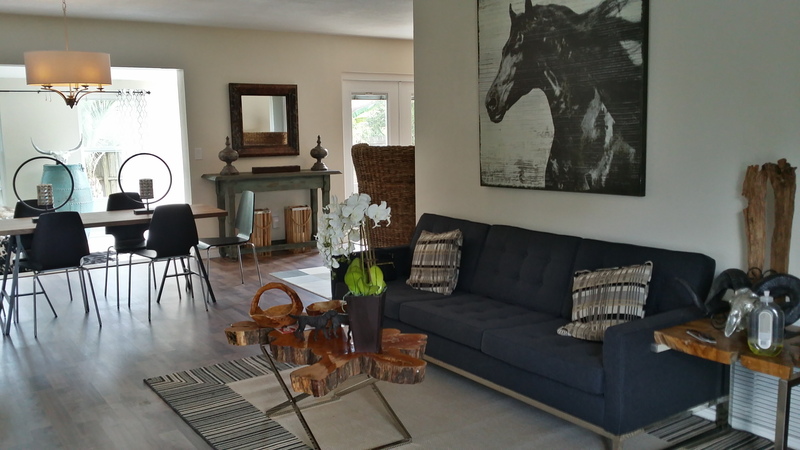 The redesign of an existing property went along with a gut remodel of a 60’s block home in West Volusia county. 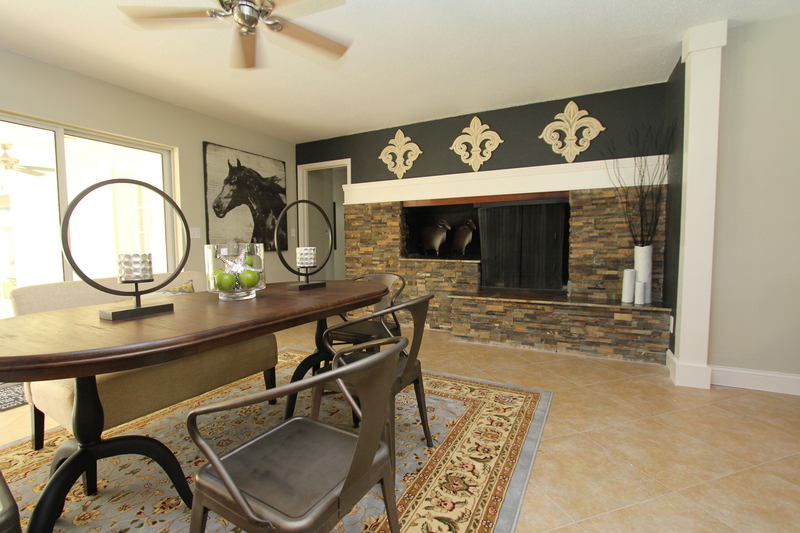 This Deltona home is proof that a house does not have to cost a million dollar to look stylish. The larger open kitchen connects nicely to the living area. 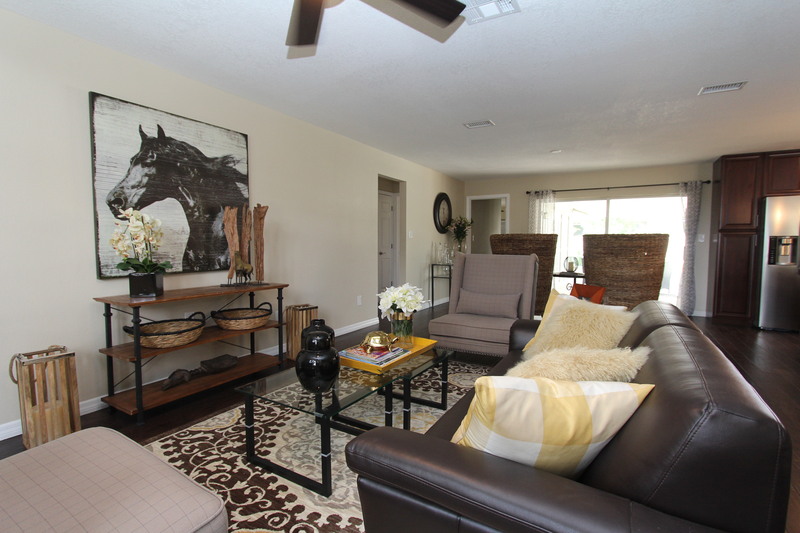 Once the living space of a little over 1500 sq ft was opened up it show its true potential. This is how you can go big on a smaller scale. Unified flooring flows seamless and connects kitchen dining and living area. The colors and the use of wood create warmth and keep it modern and fresh. 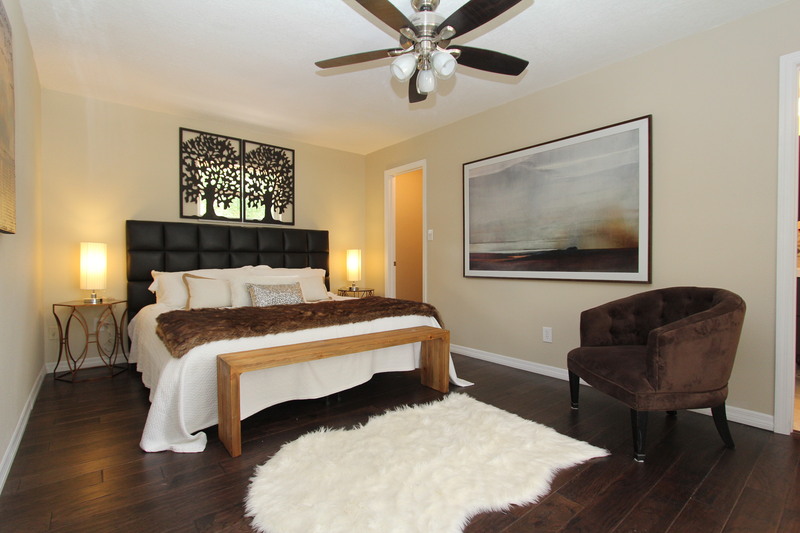 This property went on the market for $ 155k and received raving reviews from the first visitors. This property was not an easy sale. 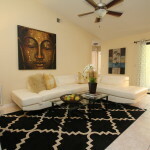 This 4 bedroom pool home had a beautiful converted garage. The room gained was a nice bonus room but posed a big problem. The garage was missing, and most buyers who looked at the house wanted a garage. The owner was willing to convert the garage back with a good offer. 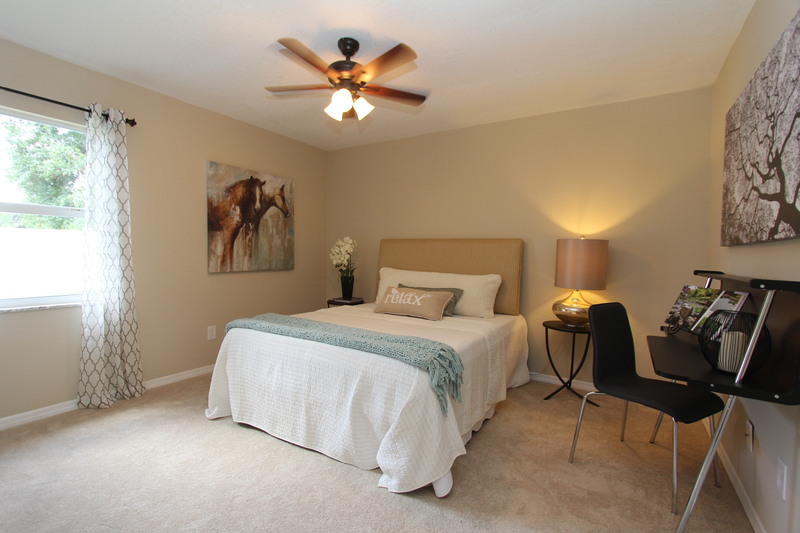 But that did not satisfy most buyers since they already fell in love with the bonus room and did not want to give up the extra space. The house went under contract but financing fell through with the first buyer. The staging helped to overcome the issues. After a total of 44 days on the market the property went under contract with a purchaser that was able to close. The property had undergone a cosmetic renovation to cure some condition issues. 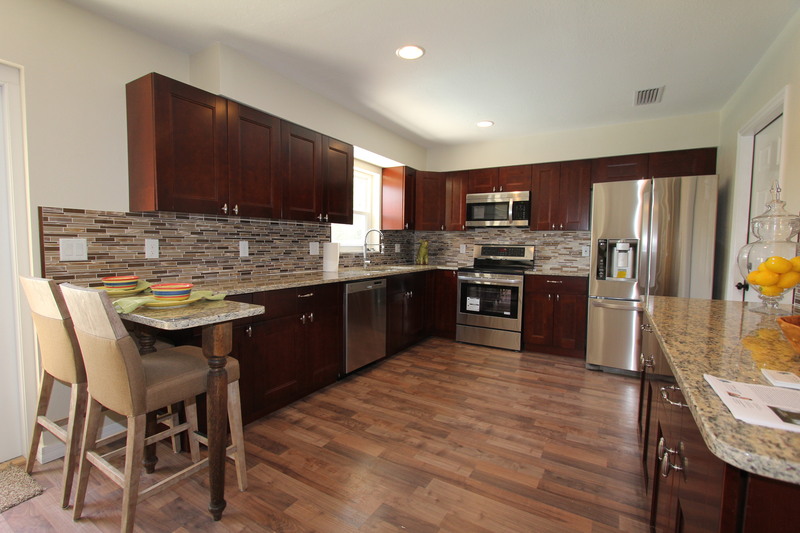 The kitchen was fixed up with the existing cabinets and granite counters. The low hanging soffit was removed to create a more open kitchen and some additional pantry cabinets were added to allow for more storage. The hallway closet was removed to open the entry way and convert some dead space to usable living area. Then the dirty family room carpet was exchanged to tile floors. Paint, repairs and a few bathroom counters did the rest in the fix up process. The staging followed a more family oriented comfortable style. The dining room wall received a dark grey back wall with mirror accents for added interest. Check out the video that shows the staging very well. This West Winter Park home sold after 2 days on the market and closed within a month. Multiple offers and a full price contract put a smile on the owners face. The staging by www.idesigntosell.com featured warm neutral tones to perfectly accompany the nice new wood floors and accent the open space. The small window over the master bed asked for some kind of treatment. Helen chose some iron ornaments to filter the light a bit and give the back wall some architectural interest. The dining space received some vintage looking mirrors to center the table and expand the visuals. It was important to define the different area in the open space so buyers could envision how the room could be furnished. 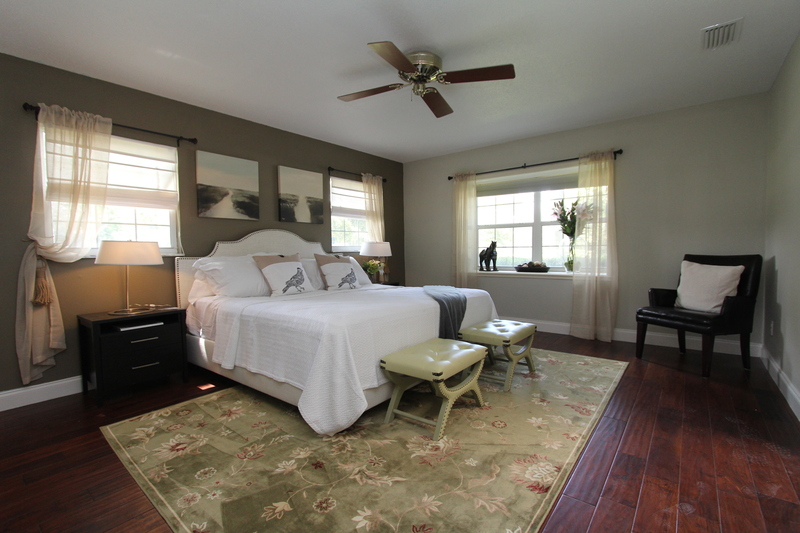 To anchor the separate areas Helen defined separate spaces with area rugs. 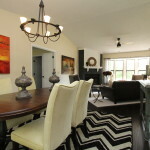 There is a dining area, the living room and a sitting area in front of the sliding glass doors. One open room with multiple use spaces. 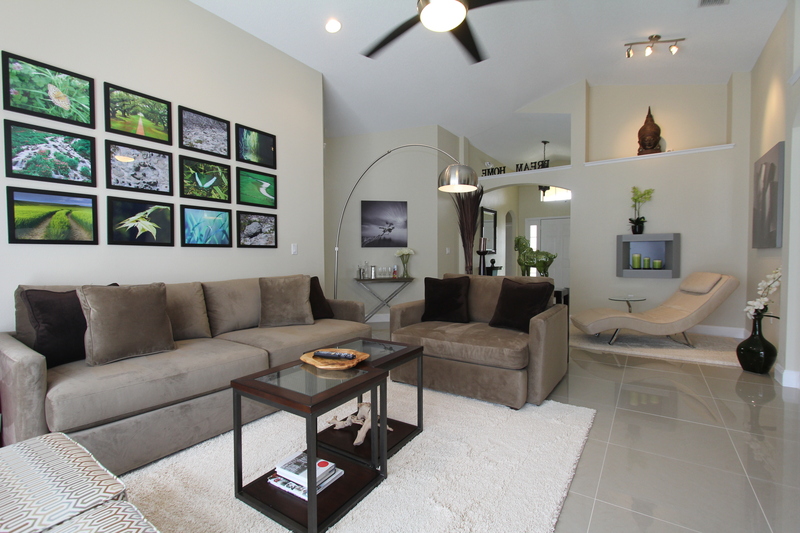 The goal was to show visitors how spacious but at the same time versatile a great room can be. 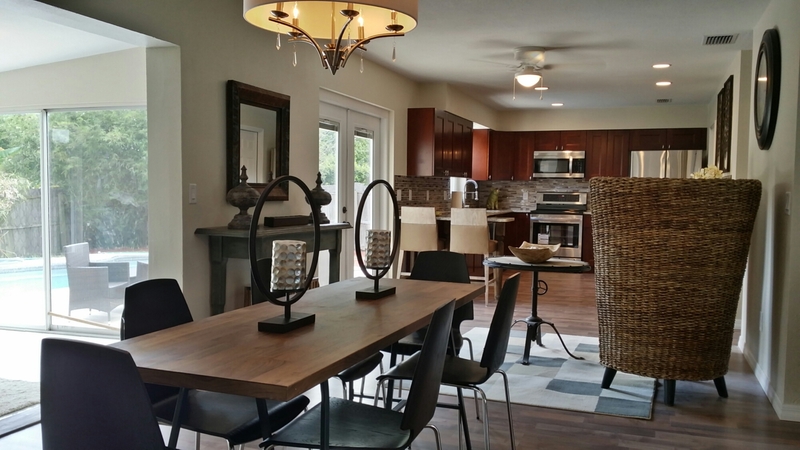 While many central Florida homes have formal areas, buyers demand for these little used spaces has declined in recent years. Large open kitchens and a spacious natural flowing floor plan seem to be on the hit list of most homebuyers. The only challenge is to demonstrate the potential of an open living room. This demonstration seemed to have left a lasting impression with the audience. About half of the buyers who toured the property made an offer. The property closed at the top end of the price bracket of comparable sales. Very few homes in the neighborhood sold anywhere near this price. This house flip went quite well for the real estate investor and the hunt for the next opportunity is on.